Farrukhsho Fraidonov, Coordinator of the Education Improvement Programme, at a training session for teachers at UCA's Naryn Campus. 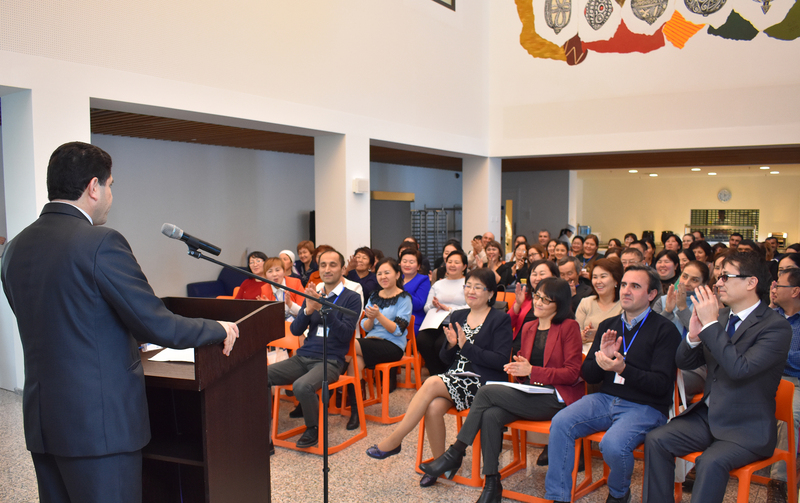 The latest initiative of the University of Central Asia is the Education Improvement Programme which engages 20 government secondary schools (grades 7-11) in each of the three Founding States of the University: Tajikistan, Kyrgyzstan and Kazakhstan. The objective is to enhance students’ academic achievements and opportunities for entry to high-quality universities nationally, regionally, and internationally, helping young people to be work ready and equipped for responsible citizenship. Working within the framework of education ministries, district education officers and school staff, the programme focuses on Science, Technology, Engineering, Mathematics (STEM), Information Communication Technology (ICT), and English. It aims to develop competencies such as critical thinking, creativity, collaboration and communication, required for full participation in the economic, social and cultural life in the 21st Century. Komilbek Mamadnazarbekov, a Physics teacher educator from Tajikistan participated in the first phase of the programme. “I have many years of experience in teaching both school children and teachers of physics, but in this professional development I have gained many new and innovative ideas and teaching methods,” he commented. “One of the many things that impressed me is teaching Physics through real life by using accessible resources that make teachers more independent of external resources. I have also learned how to teach children to be ready for coping with real life problems in future." Facilitating the professional development of teacher educators, secondary school teachers and school leaders to ensure effective delivery of the programme outcomes, the Education Improvement Programme pilots best practices and innovations that can be scaled up. Some schools are selected as a ‘Resource School’, a hub whose experience will be shared more widely with other schools, providing an important cascading effect, which over time is expected to have a much wider impact on school education. At the same time through ongoing research, monitoring and evaluation, the programme aims to provide a model that can be replicated nationally and regionally. In so doing, it contributes to improving the quality of education in Central Asia and promotes the social and economic development of the region. The first phase of the professional development programme was offered to a 64 teachers, teaching English, maths, physics and chemistry, from Tajikistan, Kyrgyzstan and Kazakhstan at UCA’s Naryn Campus in December 2018. The course was taught by experienced UCA School of Arts and Sciences faculty members and the project team. Maksim Ghuvasov, a chemistry teacher from the Lomonosov School #5 in Taldykorgan, Kazakhstan participated in the recent training. He noted: "The professional development programme was very interesting and relevant. We learnt about competency-based teaching and problem-based learning and practiced their application in subject-specific sessions. I really could see how conducting experiments through real life examples can make learning more engaging and meaningful. Our sessions were very productive, and covered mostly practice-based sessions, as well as theory." Following this first phase, the project team will continue to support the teachers as they implement the new skills they have learnt.